Discover what your favorite skills are. Identify skills to list on your résumé and CV. Know which skills to leave off your résumé, so your next job is a better fit for you. Identify your "transferable skills." The skills you can take with you from job to job. 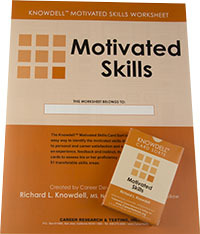 Discover your "motivated skills." Skills you enjoy using the most and are highly proficient at. Understand your "burn out skills." Those skills you are competent at, but no longer enjoy using. Discover your "developmental skills." Those areas where you want to improve, or learn new skills. And it can change your life. In just 10 minutes you will have a better picture of your skills and your career direction. Knowing what your motivated and transferable skills are is one of the four critical pieces to figuring out where and how you can be the most successful and the most fulfilled. The other three pieces are: your interests, your personality type, and your values. We have tools to help you with each one. Plus we offer face to face (over Skype) career counseling where we use all of these tools to help you find the perfect career.